There is no place on earth quite like Tokyo. Hypnotic, vibrant, fluorescent-lit streets pulsate with throngs of people streaming through jam packed avenues. The architecture is so artistic and modern that you will feel as though you have been flung far into the future. Tokyo is a mind blowing experience. Look beyond the city’s flashy exterior, and you will find a more traditional interior concealed within. 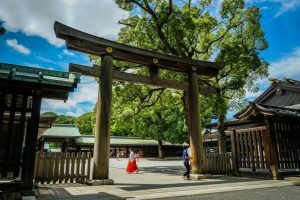 Walk long enough along Tokyo’s modern streets and you will catch glimpses of ancient temples wedged in between the modernity. 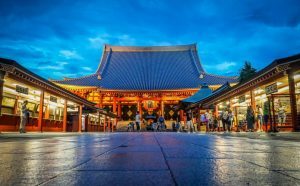 A melting pot of old and new makes Tokyo an intoxicating destination that will have you hooked within hours of exploring this place. 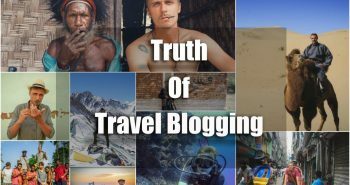 This is not only my travel story to Tokyo, but, more importantly, may help serve as your guide to Tokyo. Don’t waste your time in this city. 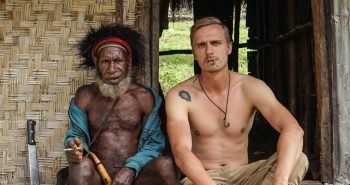 Just follow my journey through this amazing place, and I hope that you, too, can learn from my experience here. To be honest, not a lot of backpackers make it to Japan. 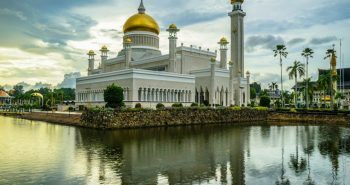 They opt for other Asian countries, because Japan is often considered too be too expensive to travel. Before journeying to Japan, I had heard that it was just another modern country with nothing to see. 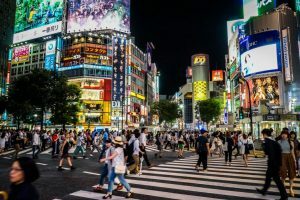 Travel to Tokyo, Japan’s thriving capital city, and all these preconceived notions you have about this place will change. I promise you this. 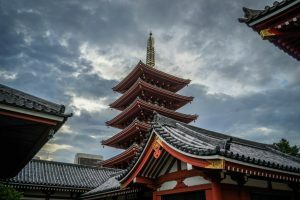 There is indeed culture here, culture so uniquely tied to the people, the architecture, and modern life in Japan. My friend, Shawn, and I landed in Tokyo’s Haneda Airport at 11 PM. getting through customs was a breeze, but the next challenge was determining how to get into the centre of Tokyo at this time of night. You can always take a cab, but this is a very expensive option. Luckily, there are buses that only cost $10 US to ride all the way to Tokyo’s Asakusa district. 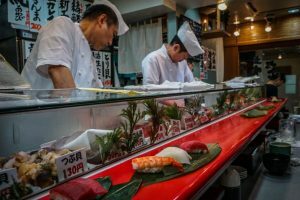 Sushi is Everywhere in Tokyo! 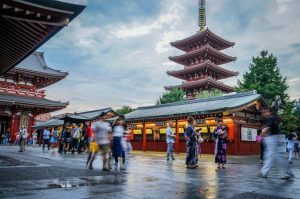 Asakusa is the preferred area to stay for independent travelers. 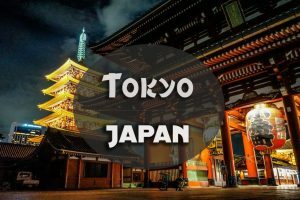 This is due to Asakusa’s many decently priced guest houses and budget accommodation options. The bus arrived exactly at 12:10 midnight, after taking us on our one-hour journey from the airport. Getting to Tokyo is very easy. Because of Tokyo’s size, it has become one of Asia’s largest hubs. Many flights from North America connect through Haneda or Narita, Tokyo’s main airport. If you happen to land in Narita, know that it is a few hours from the centre of Tokyo. If the metro is open, then its the fastest option to get to Tokyo. If you find yourself stranded in Narita Airport or Haneda late at night, do not fret. There are capsule hotels in both airports. Check them out here. 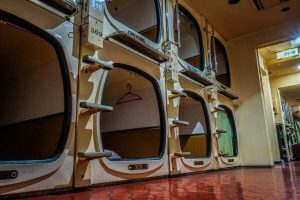 Hidden deep in the confines of one of Asakusa’s steamy back alleys lies a capsule hotel so authentic that, when its name is brought up, it is spoken in hushed tones amongst travelers. This capsule hotel will bring you back in time; 1999 to be exact. After being dropped off in Asakusa district with a print off of directions to our capsule hotel, we started walking. The hotel was not easy to find. It was late, I didn’t know Tokyo at all, and the hotel sign was only in Japanese lettering. The hotel had an English name, however. Its name is the Hotel New Tochigiya. The sign for the hotel is prominent in the dingy back alley where it resides. Upon entering the New Tochigiya. There is a familiar smell of instant noodles lingering in the air. The clerk spoke no English, nor was he interested in caring about what we were trying to tell him. Say your name, and the old man will grunt, hand you a towel, pair of slippers, and a locker key. It’s then up to you to navigate your way to your capsule. The capsules are fantastic. They are ageing and come equipped with a broken TV. Downstairs, there is a public sauna. The whole affair of staying here amounted to a unique experience that I’ll never forget. We awoke early morning, excited to get out and explore the area to sleep anymore. As it turned out, there is not much is open here at 7 am other than Lawson’s (Japan’s 7/11). However, craving breakfast, all the locals pointed us to the Izakaya. 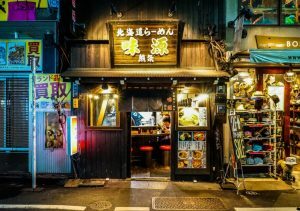 Tokyo Tip # 1: The Izakaya is essentially a Japanese style pub. Many locals head to these as they are open round the clock, and serve an assortment of Japanese dishes. There are Soba noodles, Curry, and Unagi (Japanese BBQ Eel) to name a few. If you have a hankering for a glass of Sake, you can join the old timers who are indeed crushing back a glass or two before the start of their day. Upon entering the shady looking Izakaya, you will notice a vending machine. This machine will have pictures depicting all of the pub’s delicious dishes. Select the dish you want, inset your Yen, and take the ticket you receive to the chef. It’s easy, simple, and probably the best way to get food in Japan. Asakusa district in Tokyo is a great example of the old and new contrast of Japanese culture. The historic streets are lined with shops that sell traditional Japanese art and food. Meanwhile, across the street, ultra-modern Tokyo towers loom high above, dominating the sky line, flashing their fluorescent advertisement signs. 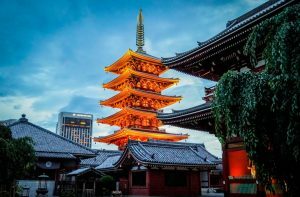 In the centre of Asakusa is Senso-ji, one of Tokyo’s largest Buddhist temples. I found myself here after trying the ubiquitous Soba Miso soup at the nearby Izakaya. Senso-ji, unlike some of Japan’s pristine temples, is still in use today. As I walked across the courtyard, devotees lit incense and placed it into a large, metal cauldron, from where it emitted the strong sent of juniper into the air. The monk’s chanting resonated through the halls and into the courtyard. Visiting Seno-ji early in the morning is a must. As I sat on the steps of the temple, listening to the sublime sounds of the monks, it was hard not to be totally captivated by the scene that was unfolding in front of my eyes. Watching the locals at Senso-ji, you will realize how deeply connected the Japanese are with their culture, despite their modern appearance. 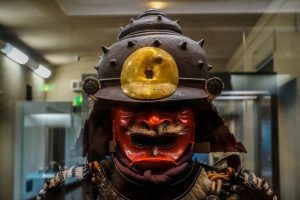 Yanaka and Ueno district is home to the Tokyo Museum, which, by the way, provides an incredible insight into Japan’s complex and engrossing history. 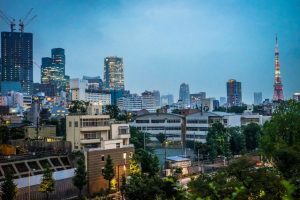 Yet more interesting is Yanaka district itself, which withstood bombing during WWII and has escaped the relentless modernisation of the rest of Japan. Yanaka is a testimony to Japan’s fascinating story. Walking the backstreets of this district will take you back in time. You will find it hard to even believe that you are still in Tokyo. 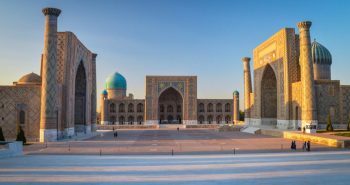 As Shawn and I wondered around here, we discovered hidden paths, concealed by the branches of juniper trees that lead to historic wooden temples flanked by massive, beautiful graveyards. The houses here have not changed much either. Many of them still include with a backyard Buddhist shrine. Most of the houses are made of solid wood, giving the area its very unique flare within Tokyo. I recommend you do as Shawn and I did. Leave the busy streets behind, just get lost in this labyrinth of old hiding in Tokyo. To get here, just hop on any Subway line and get off at the Ueno stop. From there, walk north through the Ueno-koen park, past the National Museum and into Yanaka. Check Out Tokyo’s Subway Map Here! Early morning the next day we headed down to the subway line. Our destination: the Tsukiji Fish Market. 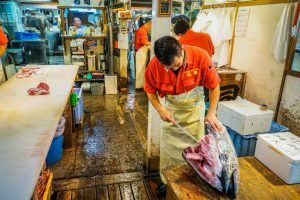 This fish market is THE place to come to get the freshest, highest quality seafood in Japan, if not the world. You must come early. 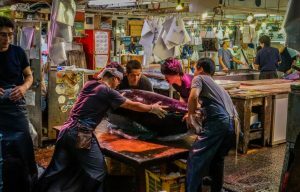 The market sells its most famous fish in the wee hours of the morning, the blue fin tuna. Get off at the Tsukijishijo or Tsukiji subway stop and follow the crowds to the market. At the entrance of the market, tourist’s line up to get the freshest cut of sushi at one of the “famous sushi” stalls. Tokyo Tip #2: Now I don’t want to sound like an arrogant pretentious douche, but that’s exactly what I am going to do. Waiting two hours in line for overpriced sushi is idiotic. If you have done this at Tsukiji then I apologize. Here’s a reality check: just walk into the market and buy fresh slices of sashimi right off the fisherman. No line ups, and the sashimi costs a fraction of the price. Travel smart. 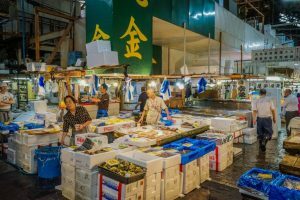 After I sampled some sushi in the Tsukiji itself, I explored the different areas of the market, each selling different kinds of fish. The elusive Fugu (puffer fish), is, by far, the hardest fish to find here. The most interesting fish I saw was 1000 lbs blue fin tuna being carried by five me who proceeded to hack it up into cuts that would be transported to various restaurants. The immense size of this fish was ridiculous! Welcome to Harajuku. It’s strange, shocking, and downright odd. The young and hip come here to show off their elaborate styles. Goth, anime, punk, whatever your style is, Harajuku will be sure to take it to a whole other level. If you are looking to purchase a stereotypical, cutsie, Japanese anime souvenir, look no further than Harajuku. My favourite was the space kitten t-shirts. Yes you heard me right: space kittens! You may have already seen photos or videos the busy cross walk of Shibuya. Actually joining the thousands of locals who use this cross walk, however, is a wild experience. High above you are street advertisements, so bright and powerful, that they must cause cancer or some other disease. 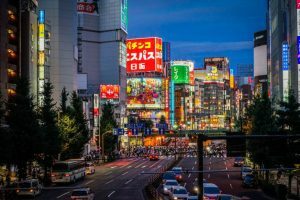 Once you get tired of the crossing, Shibuya is home to some of Tokyo’s trendiest bars and nightlife. it was here that Shawn and I met up with a friend of mine who was also traveling Japan. We devoured some Gyoza (Japanese dumplings) and dove into the many bars for some much needed Sake. The bars here have Sapporo and Kirin beers on tap for less than three dollars! 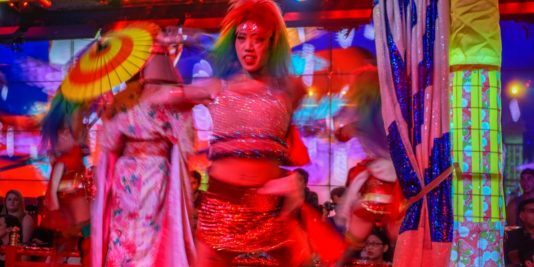 After your buzz sets in, stagger yourself east to nearby Roppongi, where the electric disco bars party well into the night. 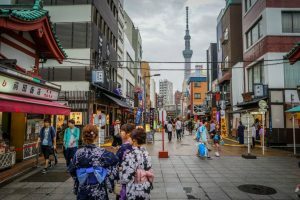 Tokyo Tip #3: Sake and beer is very cheap at Lawson’s, down a bottle or two before you delve into Tokyo’s nightlife, saving you a lot of money. In the centre of Tokyo you would expect nothing but ultra modern building soaring into the clouds above. This is true apart from the Meiji-Jingu shrine and park. 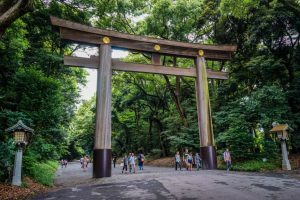 Amidst Tokyo’s pulsating loud streets is this lush ancient forested park. Entering under the giant wooden Shinto archways take you into a peaceful quite Zen paradise. Arriving here was great! the traffic, noise, and pollution can really forget to you. 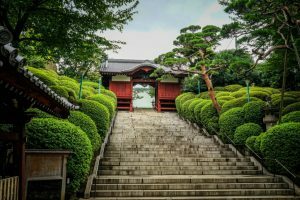 This secluded park not only eased the tension of the modern city, but is also a great look into the traditional culture of Tokyo’s olden days. 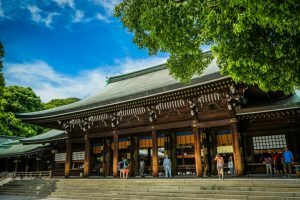 The Meiji-Jingu Shrine itself was destroyed in WWII and reconstructed exactly how it was in the past in the 1950’s. This temple is very unique, the atmosphere is very ancient feeling, and its not uncommon to see Buddhist monks walking around the temple grounds. To get here just hop off at the Harajuku stop on the Yamanote Line. From here its just across the street into the giant Cyprus and cedar trees. Another thing that is well worth getting up early to see in Tokyo is Sumo. If you are lucky enough to be in Tokyo for its annual Sumo tournaments, then great! If not then just head on down to Arashio-beya in Hamacho. To get here, head Hamacho Station on the Toei-Shinjuku line, nearest to Exit A2, and then ask anyone for Arashio Sumo. Arashio-beya practices sumo between 6:30am and 10:30am on most mornings, so be prepared for an early start. You watch the practice through a glass window from the street. The practice is free to watch, and you get a good idea how in depth and powerful this martial art is. 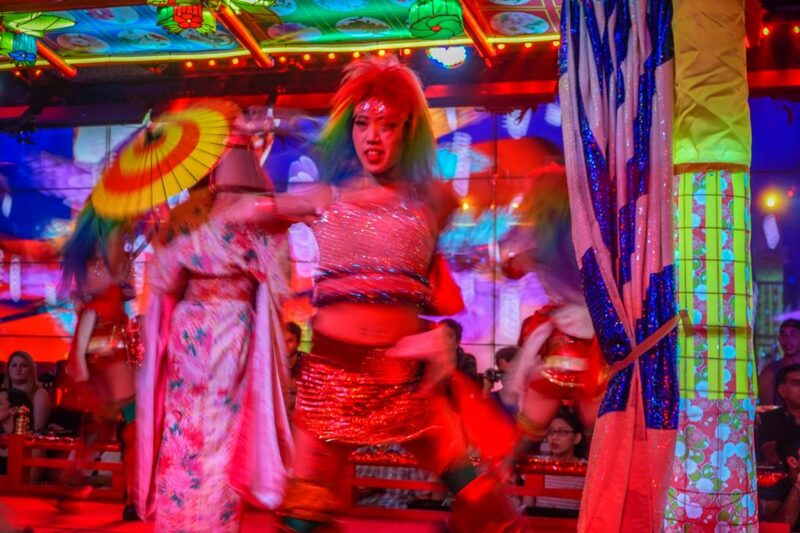 Most of the travelers joining you will leave after 30 min or so, but stick around till the end and the Sumo wrestlers will come out and introduce themselves to you. They will also proudly take a photo with you, probably to demonstrate how small and weak you are beside them! No matter how many countries you have traveled, miles you’ve walked, mountains you’ve climbed, Shinjuku will shock you. Shinjuku will take everything you know and turn it upside down. The intensely bright, vibrant streets will take you on a journey that will make you contemplate life. Ok, I am being a little over dramatic, I know. But Shinjuku really is amazing. 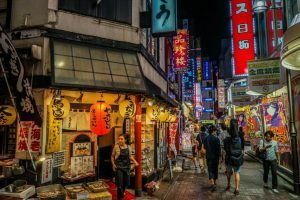 My travel hero, Anthony Bourdain, compared Shinjuku and Tokyo in general to the first time trying acid. 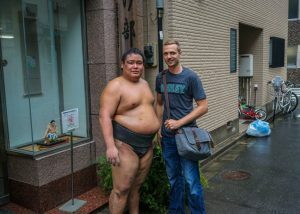 I’d like to tell you that Shawn and I only spent one night drinking in Shinjuku, but this would be a lie. 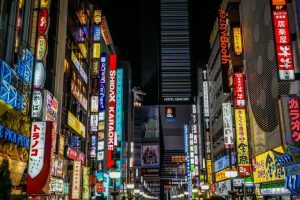 Of the five nights we spent in Tokyo, I will tell you this: a considerable amount of those five nights were spent in Shinjuku. Indeed, we spent countless hours of starring into the powerful lit streets of Shinjuku. Many glasses of Sake and Japanese beer were guzzled down. Spending time in Shinjuku is one of my fondest memories of Tokyo. I cannot wait to go back and get lost in this labyrinth of vibrant lights again. Come here with no itinerary. Walk across the busy street and enter Shinjuku. Prepare to be changed. Prepare for a whole new travel experience. 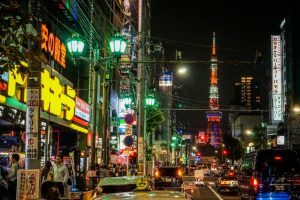 If the streets are the blood vessels of Shinjuku, then one venue in particular may just be its heart. One beautiful show. 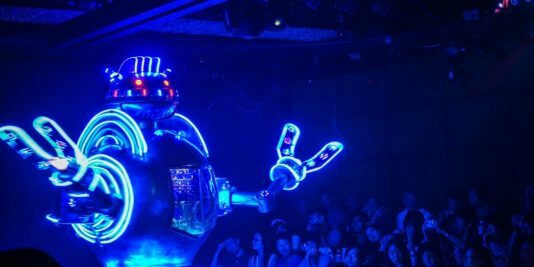 This show is called “The Robot Cabaret,” AKA “The Robot Show.” The show is located at the Robot Restaurant, on Kabukicho Street. Guide books tell you to book ahead, but don’t fret, you can just show up one hour before hand and easily get tickets. Trust me, the tickets are well worth the ¥7000 price tag. 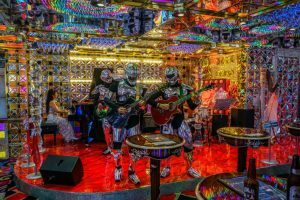 Before the show, you are entertained by some musicians dressed as robots in the Robot Bar. When the time comes for the show, you are lead down many hypnotically bright stairs that are sure to nearly give you a seizure. The show, located deep in the basement, will blow your mind away. I do not want to spoil it too much for you, but the show includes gorgeous, bikini clad, Japanese women fighting off an array of million dollar robots that shoot lasers, fire balls, and zip around on roller blades. After an hour and a half of robotastic action, you will need to contemplate life over a glass of sake in one of Shinjuku’s micro pubs. 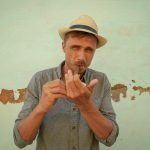 Get Tickets to the Robot Cabaret Here! 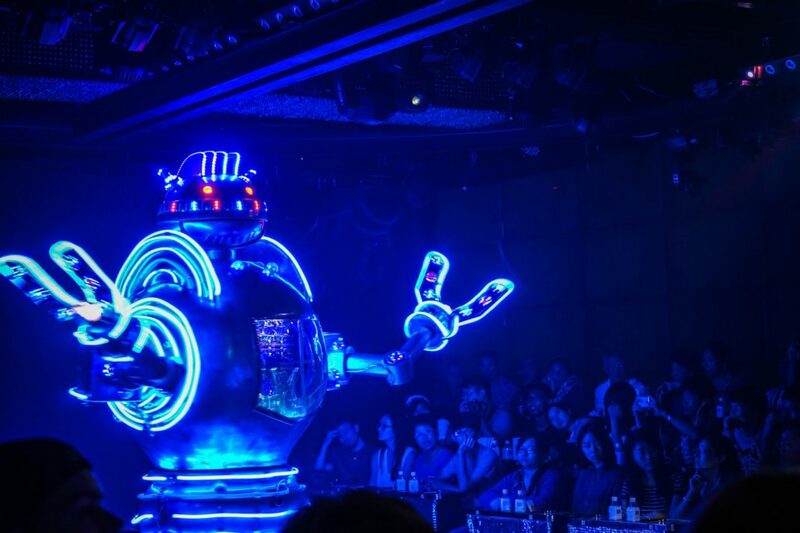 Tokyo Tip #4: If you come to Tokyo and miss the Robot Cabaret, then you can not really tell people you have been to Tokyo, because you have not until you have seen this incredible, fantastical, electrifying Robotastic show. I started taking Karate classes when I was ten years old.. When I was thirteen, I met my friend, Shawn, through Karate. Karate has stuck with me until this day. Japan is the birth place of Karate and a man named Gichin Funakoshi was its creator. Gichin Funakoshi, who died in 1957, is buried in Kamakura district, Tokyo. Shawn, who is a fourth degree black belt, made it very clear that we would not be leaving Tokyo until we paid a visit to Gichin Funakoshi’s grave. 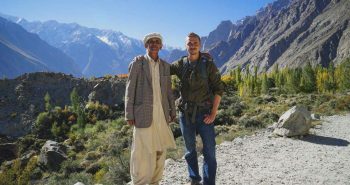 With little to no information online on finding his grave, the quest of finding the gravesite became quite the adventure. From Kamakura station we headed west and found quite a large Buddhist temple and cemetery. Even if you’re not interested in seeing Gichin’s tomb, the Temple itself is incredible. Upon entering the temple complex, just mention the name “Gichin Funakoshi” to any temple attendee and they will point you in the right direction. Tokyo has two faces, old and new. 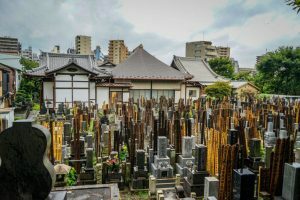 After exploring Tokyo’s vibrant, futuristic interior, we find ourselves once again in Tokyo’s deep traditional exterior in front of Gichin Funakoshi’s tomb. Gnarly juniper trees, trimmed into perfection by Buddhist monks, and ornate beautiful temples surrounded us. The atmosphere was calm, and peaceful, such a contrast to the rest of Tokyo. This was such an amazing way to end our stay in this amazing city. 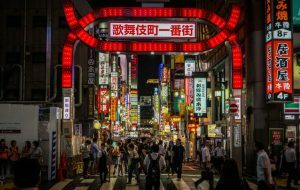 Tips: Learn some Japanese, it’s a great ice breaker when meeting locals!